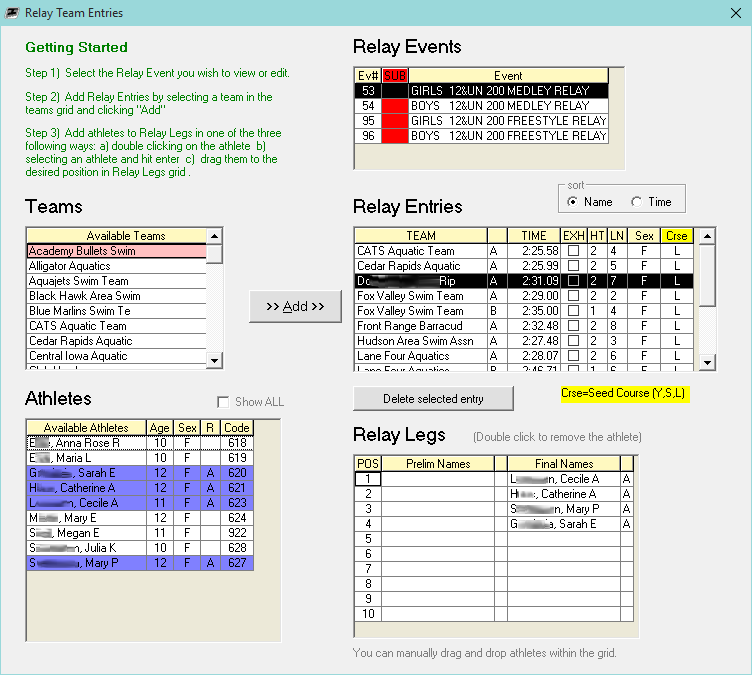 To access Relay Team Entries screen, either click Relay Entries on the main TouchPad screen, or in the Athlete Entries screen, select the Relays radio button above the events, then click a View or ADD button in the events grid if one appears. Click the desired event in the Relay Events list at the top. Click a team in the upper left Teams list and click >> Add >> (or double click on the team). 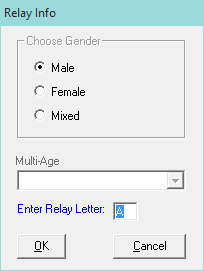 On the Relay Info screen, enter the relay letter and any other desired selections, then click OK.
Then, if you want to designate the swimmers in that relay, click the relay just added to the event, and in the lower left Athletes list either drag and drop or double click on swimmer names to add them to the Relay Legs list in the lower right for that relay. You can also drag and drop the names already in the Relay Legs list in order to get them in the correct positions. Continue this for as many relay entries as you need.